Everybody can post event ideas in this thread. Our idea of events is to play maps that cover a certain battle or theatre or that are in some kind similar, like the art of warfare (infantry, tanks, navel, etc.). The event maplist is in correct historical order. What a beautiful cute gif! @Robert: Guadalcanal - a Pacific map with inf, tanks, planes and ships - sounds good to me! OK, so please Slobo could u create a flyer ?! btw: any changes in timelimit / tickets? @Robert: not yet, because the poll ends next Monday. So let's do another 120 mins round but with a ticket ratio of only 500. After the poll we can adjust the time setting. @Slobodan: please create a flyer! Well, that was quick Thanks very much! so this weekend Breakthrough and one additional ? Maybe Nuenen? Or too small? In the back of my head sounds Ilomantsi. Can we do Ilomantsi on next week pls. That is my favourite Finnish map and I get really sad if I miss it. I can play again Fhsw on next week when I get back from Finnish lapland. And I bring back pictures from sturmbock. We had a map of desert scenario and one of the pacific, Breakthrough is western front. We can do Valirisk for example from the east front in addition. I thought either Operation Goodwood and Breakthrough or Battle of Valirisk and Omaha Charlie Sector. Or two in a different combination out of those four. I don't mind. 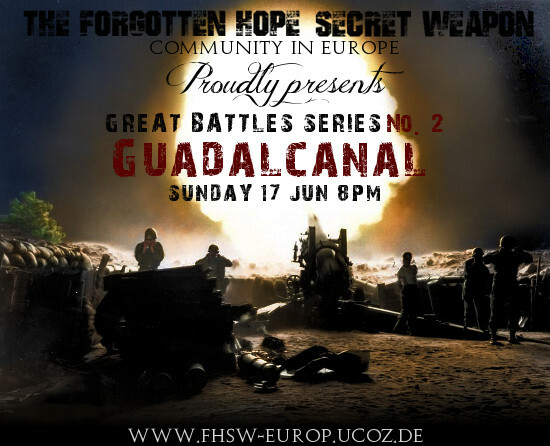 Omaha without fixed mainbase for Germans ? Will that work ? It have a lot potential to be over in some 20 minutes ?! Hmm... Maybe lets try Omaha and if it ends sooner we can do Goodwood as a next map? We could do Valirisk and then Omaha and in Case Omaha ends quickly we do Breakthrough or Operation Goodwood. Ok? Breakthrough or Operation Goodwood? I think we can do this on all maps including the push map and just restart it if it's running out or it would be annoying to do this without the end of the match?